“Today’s solemnity of Our Lord Jesus Christ, King of the Universe, the crowning of the liturgical year, also marks the conclusion of the Year of Faith opened by Pope Benedict XVI, to whom our thoughts now turn with affection and gratitude for this gift which he has given us. By this providential initiative, he gave us an opportunity to rediscover the beauty of the journey of faith begun on the day of our Baptism, which made us children of God and brothers and sisters in the Church. A journey which has as its ultimate end our full encounter with God, and throughout which the Holy Spirit purifies us, lifts us up and sanctifies us, so that we may enter into the happiness for which our hearts long. “I offer a cordial and fraternal greeting to the Patriarchs and Major Archbishops of the Eastern Catholic Churches present. The exchange of peace which I will share with them is above all a sign of the appreciation of the Bishop of Rome for these communities which have confessed the name of Christ with exemplary faithfulness, often at a high price. 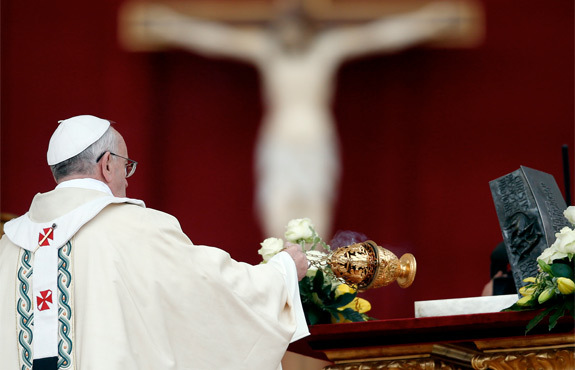 “With this gesture, through them, I would like to reach all those Christians living in the Holy Land, in Syria and in the entire East, and obtain for them the gift of peace and concord. “The Scripture readings proclaimed to us have as their common theme the centrality of Christ. Christ is at the centre, Christ is the centre. Christ is the centre of creation, Christ is the centre of his people and Christ is the centre of history. “The apostle Paul, in the second reading, taken from the letter to the Colossians, offers us a profound vision of the centrality of Jesus. He presents Christ to us as the first-born of all creation: in him, through him and for him all things were created. He is the centre of all things, he is the beginning: Jesus Christ, the Lord. God has given him the fullness, the totality, so that in him all things might be reconciled. He is the Lord of creation, he is the Lord of reconciliation. “This image enables to see that Jesus is the centre of creation; and so the attitude demanded of us as true believers is that of recognizing and accepting in our lives the centrality of Jesus Christ, in our thoughts, in our words and in our works. And so our thoughts will be Christian thoughts, thoughts of Christ. Our works will be Christian works, works of Christ; and our words will be Christian words, words of Christ. But when this centre is lost, when it is replaced by something else, only harm can result for everything around us and for ourselves. “Besides being the centre of creation and the centre of reconciliation, Christ is the centre of the people of God. Today, he is here in our midst. He is here right now in his word, and he will be here on the altar, alive and present amid us, his people. We see this in the first reading which describes the time when the tribes of Israel came to look for David and anointed him king of Israel before the Lord. In searching for an ideal king, the people were seeking God himself: a God who would be close to them, who would accompany them on their journey, who would be a brother to them. “Christ, the descendant of King David, is really the ‘brother’ around whom God’s people come together. It is he who cares for his people, for all of us, even at the price of his life. In him we are all one, one people, united with him and sharing a single journey, a single destiny. Only in him, in him as the centre, do we receive our identity as a people. “Finally, Christ is the centre of the history of humanity and also the centre of the history of every individual. To him we can bring the joys and the hopes, the sorrows and troubles which are part of our lives. When Jesus is the centre, light shines even amid the darkest times of our lives; he gives us hope, as he does to the good thief in today’s Gospel. “Whereas all the others treat Jesus with disdain – ‘If you are the Christ, the Messiah King, save yourself by coming down from the cross!’ – the thief who went astray in his life but now repents, clings to the crucified Jesus and begs him: ‘Remember me, when you come into your kingdom’. Jesus promises him: ‘Today you will be with me in paradise’, in his kingdom. Jesus speaks only a word of forgiveness, not of condemnation; whenever anyone finds the courage to ask for this forgiveness, the Lord does not let such a petition go unheard. Today we can all think of our own history, our own journey. Each of us has his or her own history: we think of our mistakes, our sins, our good times and our bleak times. We would do well, each one of us, on this day, to think about our own personal history, to look at Jesus and to keep telling him, sincerely and quietly: ‘Remember me, Lord, now that you are in your kingdom! Jesus, remember me, because I want to be good, but I just don’t have the strength: I am a sinner, I am a sinner. But remember me, Jesus! You can remember me because you are at the centre, you are truly in your kingdom!’ How beautiful this is! Let us all do this today, each one of us in his or her own heart, again and again. ‘Remember me, Lord, you who are at the centre, you who are in your kingdom’. “Jesus’ promise to the good thief gives us great hope: it tells us that God’s grace is always greater than the prayer which sought it. The Lord always grants more, he is so generous, he always gives more than what he has been asked: you ask him to remember you, and he brings you into his kingdom! Let us go forward together on this road!”.